A symbol of the Spring and New Life, Communicator and Stability. 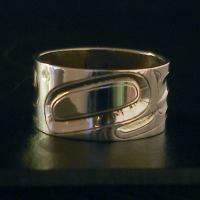 Salmon Egg Ring by Lloyd Wadhams Jr.
Sun represents life abundance and its warmth radiates healing and peace. A symbol of the Spring and New Life, Communicator and Stability. Frog often represents the common ground or voice of the people. Creation & Knowledge - bringer of the light and magic. One of the most prominent figures of the first peoples. The Orca is a popular symbol for romance as they mate for life. A variety of designs available.